WASHINGTON -- Oddly, the closer Hurricane Florence gets to land, the murkier its future gets. Usually when a storm approaches the coast, forecasters can tell with ever-increasing accuracy who will get walloped. Not with Florence. Florence is becoming more of a threat to more people -- now including some in Georgia -- in more ways. The more it stalls, the more it rains. The National Hurricane Center is calling for 20 to 30 inches of rain in North Carolina, with spots up to 40 inches. The more it hovers just off shore, the more potentially deadly storm surge it could push on-shore. "For a meandering storm, the biggest concern -- as we saw with Harvey -- is the huge amount of rainfall," said Chris Landsea, chief of tropical analysis and forecast branch at the National Hurricane Center. CBS New York chief weathercaster Lonnie Quinn reports the worst part of the storm is the front right quadrant because you get the highest winds and the storm pushes that water onto the shore. Water could rise up to 15 feet. 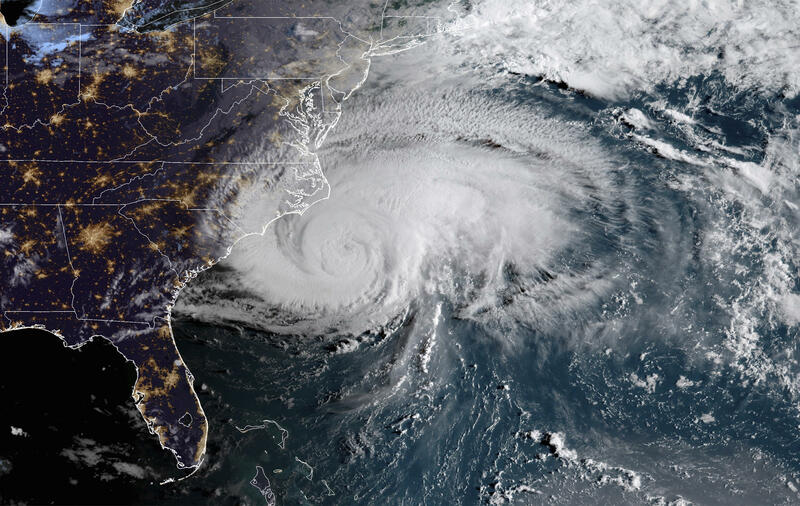 "It certainly is a challenge forecasting precise impacts when its exact track won't be known until a day in advance," Landsea said: There's "a huge difference" in the size and type of damage Florence inflicts if it stays 50 miles off shore versus heading inland immediately. Steering currents -- around clear-weather high-pressure systems and stormy low-pressure systems -- redirect hurricanes, with the clear-weather systems acting as walls that storms have to go around. Forecasts show those currents giving Florence no sense of direction in a day or so. Masters said there's a tug-of-war between two clear-skies high-pressure systems -- one off the coast and one over Michigan. The more the Great Lakes one wins, the more southerly Florence will be. Computer simulations -- especially the often star-performing European model -- push the storm further south, even into South Carolina and Georgia. The hurricane center also adjusted its projected track, but kept it north of what most computer models were showing, to provide some continuity with past forecasts. Private meteorologist Ryan Maue of Weathermodels.com in an email called the overnight European computer simulation "another model run for the ages. So many weird/outlandish solutions -- but that's what happens when the steering currents collapse."